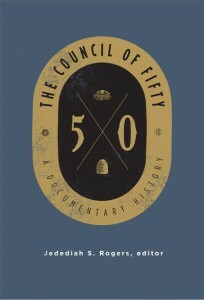 I don’t have time to do a proper review of the 490 pages of The Council of Fifty: A Documentary History (Signature Books, 2014), edited by Jedediah S. Rogers, so I am just going to start writing and see what happens. The book hits the bookshelves today, so it’s a potential Christmas gift for the Mormon history fan in your life. Required: working knowledge of 19th-century Mormon history. The book is a collection of selections from publicly available documents that address the Council of Fifty: letters, diaries, journals, manuscripts, research notes, LDS historical documents. While the editor provides helpful footnotes and introductions, a reader who doesn’t have a degree of familiarity with names and places of 19th-century LDS history will be a bit lost. This probably eliminates 80% of the active LDS population but hopefully not many readers of this review. Recommended: the Klaus Hansen book. Not required, but helpful, is Klaus Hansen’s classic 1967 book Quest for Empire: The Political Kingdom of God and the Council of Fifty in Mormon History. This was one of the first LDS history books I ever ran across, as an undergrad at BYU. This was the book that morphed the secret Council of Fifty, known by few, into the Council of Fifty that everyone could talk about. With this newly published documentary history from Signature, there is now more to talk about. Hansen graciously wrote a foreword for the new book, noting that “I found documents elusive” when doing research for his earlier book, which he retrospectively describes as “tentative, awaiting further research” (given the lack of documentation). He seems both pleased with the additional documentation produced in the new volume and flattered that the topic remains of interest to researchers and readers alike. Missing: the official minutes. The book uses a lot of sources, but a few sources are still restricted. Some of these are slated to be published at some point as part of the Joseph Smith Papers. My impression is that most of what there is to know about the Council of Fifty is more or less evident from the sources presented in the new book. As the editor candidly notes in the Preface: “Some of the documents are still restricted from public view at the LDS Church History Library. … Readers of this volume deserve to know specifically what documents the church withheld from me: They are: the Nauvoo founding minutes and notes relating to the Council of Fifty; the council minutes kept in Utah Territory; some official council records such as roll books for the years 1845, 1849, 1867, 1868, 1880, and 1882; and extant diaries for Horace S. Eldredge, Heber J. Grant, Moses Thatcher, and Brigham Young Jr. Fortunately, much — although not all — of this material is available from other sources such as the transcripts historian D. Michael Quinn prepared in the 1970s when he was allowed to see the originals” (p. xiv-xv). How secret was it? The Council of Fifty was organized by Joseph Smith in early 1844. Initially, it considered the problem of where the Saints might relocate if forced to leave Illinois, but within a short time was focused on coordinating support for Joseph Smith’s presidential run. It was never a publicly acknowledged body. Its deliberations were intended to be confidential, as noted by a variety of participants quoted in the first section of the book. In the Introduction, the editor notes that when the first (and only) issue of the Nauvoo Expositor was about to be published in June 1844, Joseph realized that “the sacred confidence of the General Council had been violated” and he then told William Clayton to “get rid of the council records,” which he did … sort of (p. 7). But seriously, how secret can a committee of fifty people be? Plenty of participants who had apparently sworn themselves to secrecy then went home and wrote about what went on in the Council in their journals (! ), sometimes generally, sometimes in some detail. Such entries constitute a good chunk of the book. Frankly, the idea that a group that large could or would maintain any degree of secrecy for more than about two weeks is simply not tenable. As the saying goes, fifty people can keep a secret if forty-nine of them are dead. The whole game plan here seems to show that Joseph was not thinking very clearly in his last few months, perhaps understandable given the challenges and pressure he was facing both within the Church and from external adversaries. The juicy stuff. LDS Church leaders have not kept the official minutes of the Council of Fifty (in part, the ones William Clayton sort of got rid of) locked away in the archives for no reason. The Council apparently voted or ordained Joseph king in one of the first meetings (p. 44-45), as recorded by the talkative William Clayton in his journal. Others more discreetly noted “had a very interesting time” or “closed the Council with shouts of Hosannah” for the activities that day. Sources suggest Brigham Young (p. 229) and later John Taylor (p. 299) might have also taken that title in connection with the Council, but the sources are a little iffy. Having successfully severed ties with an English king and fended off Federalist attempts to make the Presidency something like a monarchy, Americans don’t react well to the idea of kingship, much less secret kingship. To 19th-century Americans, this would have sounded slightly treasonous. To 21st-century Americans, it just sounds bizarre. The big picture. One thing the reader does get from reading the book is a bigger historical picture of what was going on in the country that Joseph and other leaders had to deal with. Under Joseph, the Council was considering a variety of national issues (the Oregon Country was at that time still disputed and Texas was an independent republic, which offered some advantages as a possible destination). Under Brigham, the Council traded correspondence with Congress, considered reports and maps about land to the west, sent out scouts to contact Indian tribes out West, and ultimately planned and led the migration to the Salt Lake Valley. Once the Saints were established in Utah, the Council became more of a ceremonial body, but under John Taylor the Council took on more importance for a few years. They continued to petition Congress for official statehood by drafting and submitting drafts of a state constitution. There is also brief discussion of a couple of unpublished revelations through John Taylor that were accepted by the Council (p. 298), but from the vantage point of 2014 the key term is “unpublished.” Taylor’s attempt to bring a more revelatory approach to running the Church did not survive his passing. Neither did the Council of Fifty. From the editor’s footnote to the last documentary entry: “John Taylor died on July 25, 1887. The Council of Fifty apparently never met again ….” The later sections of the book make me want to go look a little closer at the events of John Taylor’s presidency. Fifty: a nice round number. Why 50? I haven’t seen any discussion of this basic question. There is something terribly unbiblical about the round number 50. Given Joseph’s propensity for things ancient, I would have expected a Council of 49 or a Council of 144 or a Council of 72. Just picking a nice round number like 50 suggests Joseph was perhaps starting to take a more modern view of things. The Council might have voted him king one day, but he was soon running for president, a thoroughly modern office, and that is what occupied the Council for a busy two months. There was no particular biblical or scriptural precedent for the Council of Fifty — Joseph just thought it up as a response to deal with some pressing issues presented to him and other leaders, got a rather lengthy official name for the Council by revelation (“The Kingdom of God and his Laws, with the Keys and power thereof, and judgment in the hands of his servants, Ahman Christ,” p. 29) then went to work. In an odd way, it prefigured the organizational style of the modern church we are familiar with (or perhaps not that familiar with: the Church does not to my knowledge publish its org chart). The public offices are ecclesiastical (apostles, seventies, councils) but the less visible organization that makes decisions and authorizes budgets, investments, and expenditures is corporate: boards, committees, departments, and managing directors. Had Joseph opted for a functional name rather than a revealed name, the Council might have been called The Committee on Relocation or The Public Affairs Committee. A strangely modern institutional feature that pursued largely practical goals: election, relocation, statehood. This and more you will get from reading The Council of Fifty: A Documentary History. Note: Clair over at WWE posted a nice review of the book two days ago, with additional historical detail and a bit less casual commentary. Go give it a read. The arrogance was remarkable. “King of the World”? This isn’t revelation. It is hubris. Joseph being anointed King makes perfect sense in context of Zion as a theocratic monarchy, combining secular and religious authority in one system with one person at the head (who in turn reported to God). As for arrogance, well, prophets claim to speak for God, its not really any more arrogant to claim kingship. Especially since, according to the old Testament, God was personally involved in appointing (and removing!) the Kings of Israel. Though it is funny that the Old Testament also says that God only authorized a monarchy when the people asked for one; He apparently preferred the system of judges. Dave, if the official minutes are not included in this volume but will be published in a few years as part of the Joseph Smith Papers Project, does that mean that the most valuable information on this topic is still a little down the road? It seems we have had to figure out what we can based on secondary sources like journal entries, and the official meeting notes have the potential to really shift how we put the pieces together. Is there a risk that this $50 book will be obsolete once the rest of the documents are out, or will this still have value? One thing I especially appreciated about this book was Klaus Hansen’s participation. His difficult to find book about the Council of Fifty is one of the few sensible things covering this little-known subject, which has been sensationalized for various agendas. Kofford Books has long been promising a new edition of this classic, but no release date has been given. I hope the JSP releases on this topic will help Klaus do the new edition. I also hope both he and I live long enough for that to happen. JMS, in addition to what Dave said, because 2/3 of the book deals with the Utah period (the JSP volume–slated for a mid-2016 release–will include minutes from the Nauvoo era only), it will still be of value for that reason alone. And, because the contextualizing information in the current volume for the Nauvoo era provides background to the minutes themselves (some of which may very well be duplicated in the JSP volume in intros & annotation), that era will still be valuable, I would think. “To 19th-century Americans, [Joseph Smith being annointed king] would have sounded slightly treasonous.” This strikes me as a considerable understatement. My understanding is that Joseph’s arrest for the destruction of the printing press was on charges of treason, and there was a lot of rage with how he was using the Nauvoo charter and courts to evade arrest and extradition to Missouri. Does anyone know if the actions of the Council of Fifty were discussed in the Nauvoo Expositor or brought to the attention of the Warsaw press? I don’t think it was public knowledge but have no doubt that if it were known that Joseph had himself anointed king, that would have outraged his enemies and caused a significant uproar. Joel, the initial arrest was for the destruction of the printing press, and several others as well as Joseph were arrested. At Carthage, all were granted bail and free to return to Nauvoo — but before Joseph left town a treason charge was filed and the Judge entertained that charge and did not grant bail. Local citizens might have taken that charge at face value, but in retrospect it is pretty clear that was just one more trumped up charge among many that were tossed back and forth as conflict between Mormons in Nauvoo and locals in surrounding towns escalated. That fact that shortly thereafter Joseph was murdered while in state custody shows plainly who was flaunting the law in order to accomplish illegal designs. Dave, thanks for the clarification. How are the footnotes organized? Are they true footnotes, placed at the foot of the page where they’re accessible, or are they endnotes? If endnotes, are the note pages sensibly labeled “Notes to Pages # – #” like the good Lord intended? I ask because a well-done set of footnotes is a joy and a blessing; constantly going back and forth between the middle and the back of the book and trying to recall which chapter I’m in (“Is that note #17 the right note #17, or one from a different chapter?”) can be a real pain in the neck.